In case you missed the news, Final Fantasy XIV: The Lodestone is holding an event over the course of the next two weeks that kicked off yesterday, and players don't want to miss out on this one. The Heavensturn event celebrates the new Zodiac year, which is the year of the dog, with themed items and a new story for players to explore. Here's the story that the event will follow for the next two weeks: "A delegation from the Far East has come to Eorzea to celebrate the advent of the year of the rooster, but it appears their leader is having trouble garnering the local citizens' interest. Spurned─for reasons unbeknownst to him─by each and every person he attempts to approach, the tori bugyo is desperately trying to rectify a Heavensturn festival that may already be beyond salvation." 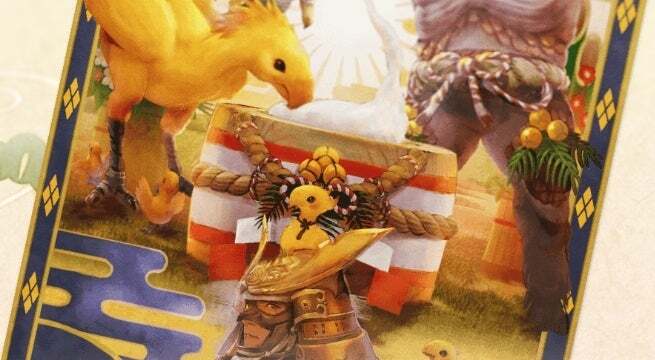 Four new items are available for players to earn during the event, including the Red Tori Kabuto Armor, the Black Tori Kabuto Armor, a Heavensturn Orchestrion Roll, and an adorable "Happy New Chocobo" to decorate their HQ with. Heavensturn is an annual event that began after 2014, celebrating each incoming new year with a new adventue and a few goodies for players to earn to reward them for their loyalty to the game. Naoki Yoshida, the game's director and producer, wrote in a new blog post today that even more updates to the game were coming at the end of the month, and went as far as teasing the new story installment with one riddle of an image. Players have until January 15th at 6:59 AM PST to complete the event's missions, because once it closes, the ability to complete them will no longer be available. Final Fantasy XIV is available now for PlayStation 4, PC, and Mac OS.